When people try and say that performance-enhancing drugs only make a minor difference in fighting, the case of Vitor Belfort blows the argument out of the window. Sure, all of the PEDs in the world can’t overcome a lack of fighting skill, stamina, training, and toughness. But take a gifted fighter with tons of experience who is aging, and the difference is more than significant. Belfort, whose career is likely coming to an end later this year, will be used as the prime example for decades to come of the TRT era of the sport. Belfort was a very controversial recipient of being allowed to use testosterone replacement therapy due to him having received a diagnosis of a low natural level of testosterone. Belfort being given that exemption was controversial because he had a previous steroid suspension from years earlier. It’s fruitless to try and say what Belfort did or didn’t do for much of his career in regard to PEDs because of the criminally lax testing procedures the sport has had for most of its existence. But it’s also impossible to not be suspicious of someone who failed a test, whose body had gone through many different incarnations over the years, and who later was diagnosed with low natural testosterone. What we do know is that Belfort was given a testosterone use exemption for medical reasons in 2011, and that from the age of 34 until the age of 36, he went 5-1. Keep in mind that in this sport, it’s not so much the age of a fighter as it is the miles, and Belfort’s career began in 1996, so he was 15 years in by the point he began using TRT. And the 5-1 record hardly tells the story until you realize the five wins were all finishes, four in the first round and one in the second, and more importantly, the victims were named Yoshihiro Akiyama, Anthony Johnson, Michael Bisping, Luke Rockhold and Dan Henderson. Aside from Akiyama, a one-time headliner in Japan who was past his prime by that point, you had Johnson, the single most dangerous knockout artist in the sport, who followed that loss with a path of destruction like few others in history; Bisping, the current UFC middleweight champion; Rockhold, the former UFC and Strikeforce middleweight champion; and Henderson, who while past his prime, was an unquestioned Hall of Famer. In his big 2013 run, Belfort looked like Hercules and knocked Bisping, Rockhold and Henderson all out with head kicks. He beat everyone put against him except Jon Jones. There are limitations. Moving up a weight class and taking a short notice fight against arguably the greatest fighter in the history of the sport was too much for even the enhanced version of Belfort. But let’s not forget that he nearly beat Jones with an armbar in the first round, and it was only due to the tremendous guts of Jones — who withstood an elbow injury rather than tap — that led Belfort’s gas tank to run out after that point. If not, Belfort would have arguably gone on one of the greatest runs the sport had ever seen. And then, like the living embodiment of the play “Damn Yankees,” Belfort’s deal with the devil expired. Well, not exactly. The Nevada Athletic Commission ruled that due to all kinds of problems, they were dropping their testosterone use exemptions. The move was well meaning, and in the long run, needed to be done. But it created an issue. An aging athlete who had used testosterone regularly for long periods of time, whether prescribed by a doctor or not, is going to in many cases go through changes when that testosterone is taken away. In the case of Belfort, it has been four losses in five fights, with three of those losses in the first round. 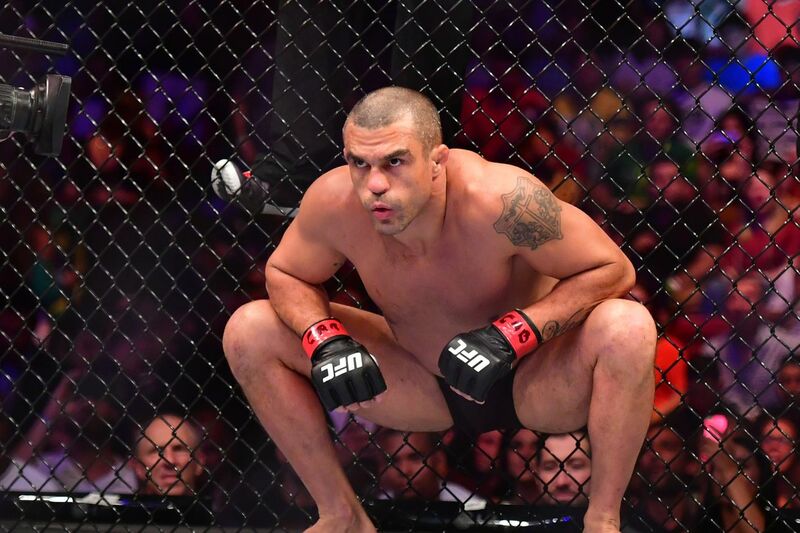 On Saturday night in Fortaleza, Brazil, the 39-year-old Belfort drew a sellout crowd for what was likely one of his last fights. He lasted 3:52 with Kelvin Gastelum, a fighter who spent most of his career at 170 pounds. Worse, this surprised nobody, as people knew the gig, and Belfort was the heavy underdog even before weigh-ins showed him looking like the father of arguably the best fighter of 2013. Within a couple of years, Belfort’s body changed from that of a bodybuilder with great explosiveness in all of his movements to a middle-aged recreational tennis player struggling to just last against stronger fighters. Bulging muscles changed into skinny, old and soft, Belfort looking like he aged from 28 to 48 overnight. And his performance changed accordingly. With Gastelum, there were moments when you could see the flashes, the quick and accurate hands, but Belfort couldn’t sustain those moments for more than a few seconds. The Belfort that became a mainstream superstar in Brazil, and one of the earliest U.S. stars of MMA, was gone. Some will call him a cheater. But he was given the exemption and what he did was allowed by the rules in place. If anything, his career exposes just how ridiculous those rules really were. He possibly could have been world champion, as he was easily the top middleweight contender when Nevada, and then the UFC, put its foot down on TRT. Then, the UFC followed up with legitimately stringent drug testing. He was a split-second from taking the light heavyweight title and beating one of the best fighters in history. Granted, there was a test where he was over the limit in 2014, and he was actually the person who turned TRT into such a headache to commissions that they threw it out. In the end, that benefited the sport, because if we were still in the TRT era, the abuses of that rule would have continued. But the difference in the 2013 Belfort and the 2016 Belfort shows exactly how much testosterone use changes the game. Let’s look at what is next and how fortunes changed for five stars of Saturday’s show. KELVIN GASTELUM — Gastelum (14-2) is an interesting case. His win over Belfort made him 4-0 in UFC as a middleweight, but he’s still talking about moving back to welterweight. One can see why, as last summer, he came out of a hospital bed and the next day fought current welterweight champion Tyron Woodley to a close loss after missing weight. In his eight scheduled welterweight fights, he missed weight three times, including once by ten pounds and another time his inability to make weight caused the cancelation of a fight with Donald Cerrone. Gastelum is really the example of where more weight divisions would benefit him. If there was a 175-pound, or even an 180-pound division, it would fit him perfectly. He’s been successful at 185, but the top stars of the division, like Luke Rockhold, Chris Weidman and Yoel Romero would have a huge size advantage over him. He was also successful at 170, but unless he makes some great changes, for UFC to book him at that weight is rolling the dice. At middleweight, most of the top contenders are already scheduled for fights, or injured. The idea of Gastelum vs. Anderson Silva (34-8) at UFC 212 is viable. Gastelum against Derek Brunson (16-5) is another good test. And if the timing for either of those fights doesn’t work, Daniel Kelly (11-1) may not look pretty or win pretty, but he wins the close ones. VITOR BELFORT — Belfort (25-14) said after Saturday’s loss that he’s got one fight left on his contract, and would like to fulfill it, and UFC 212 would be the place to do it if he’s recovered enough to make that date. With Belfort, you would want a farewell fight to be a big deal and against a name opponent. Silva actually fits the bill, as it was their 2011 fight in Las Vegas that really lit the fire that led to the explosion of UFC in Brazil. But the UFC has tried for six years to make that rematch of a fight Silva won via first-round knockout, and in every case, they couldn’t get both sides to agree. Dan Henderson, a longtime rival, has retired. Michael Bisping has bigger fish to fry as UFC champion. Johny Hendricks (18-6) is a big name and isn’t really a good fit for such a match, but at this point, the pickings are slim. MAURICIO “SHOGUN” RUA — Another legend from the past, Shogun (25-10) is 35 years old, but it’s the mileage as his career is coming up on its 15th anniversary. He’s won three in a row after finishing Gian Villante on Saturday. It’s hard, as the UFC has lost some key light heavyweights who he could face like Phil Davis, Ryan Bader and Nikita Krylov. The most logical opponent is a name not on the roster, in Quinton “Rampage” Jackson. Jackson’s contract with Bellator runs out with his fight on March 31 against King Mo Lawal. But it’s telling that Jackson is not fighting at light heavyweight. Jackson and Rua fought in Pride in 2005, and if UFC comes to Japan in September as is rumored, and signs Jackson, that would be a fight that would make sense in that marketplace. EDSON BARBOZA — Barboza (19-4) hit a jumping knee knockout of Beneil Dariush on Saturday that will be heavily discussed when people talk about awards at the end of the year. Barboza is also a tough man to match-make for right now. He lost to Tony Ferguson. He’s not getting Conor McGregor, nor likely Khabib Nurmagomedov. Eddie Alvarez is taken with Dustin Poirier. Michael Chiesa (14-2), who is ready to return after a back injury is the highest-ranked fighter he could face next, but it’s a fight that really just bides time for Barboza as a win isn’t going to elevate him. Kevin Lee (14-2), who ended Francisco Trinaldo’s winning streak on Saturday, also fits into that category of what on paper looks like an entertaining fight, but Lee would have everything to gain, and Barboza would have nothing to gain. RAY BORG — Borg (11-2) scored a decision win over Jussier Formiga (19-5), who came into the fight as the No. 3 ranked contender at flyweight. Borg wisely mentioned wanting the winner of the April 15 title fight on FOX with champion Demetrious Johnson (25-2-1) against Wilson Reis (22-6). Given that Johnson has gone through almost every contender, Borg could get that shot based on the idea that the only two who could get it are Borg and Joseph Benavidez (25-4). Benavidez’s record is more impressive, with six straight wins including beating Henry Cejudo. But he’s lost twice to Johnson, although the last loss was in 2013 and he’s been regarded as No. 2 behind Johnson in the division consistently since its inception. You could argue the fight to make is Borg vs. Benavidez. The winner of that would clearly have earned a championship fight. UFC London Video: When you’re British but train at Tristar, do you back Bisping or GSP?